See: PopTech review: What’s bothering Franke James? 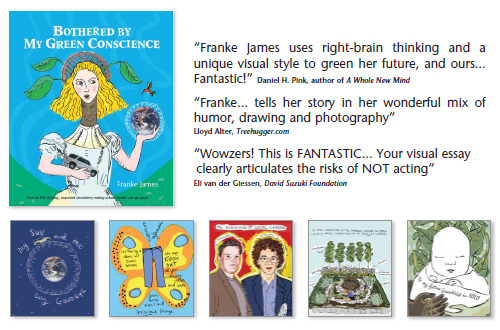 Sheril Kirshenbaum’s review: “…a unique read from artist Franke James entitled Bothered by My Green Conscience. This is no ordinary book. James uses colorful artwork and photography to convey her message and the result is an extremely successful convergence of images and ideas… I really enjoyed flipping through this creative account of climate change and personal decisions. I’m not alone either: Bothered by My Green Conscience recently won the 2010 Green Book Festival Award for Graphic Novels. P. A. Monteiro’s “Bothered” review: “Even though I had read all of the visual essays online, reading the essays in Bothered… was a totally different experience and the essays were easier to read. I also didn’t appreciate how much work goes into creating each visual essay until I saw the illustrations on the pages of the book. The visuals that Franke James uses with her words are way more powerful in conveying her experiences and thoughts than any book with only words could be. “This is not a bummer book. The author in question does not employ a preachy or apocalyptic tone. This is not another little book-as-accessory for the green chic elite. Instead, James has searched her conscience, taken stock of the problem, noted the contradictions in her own behavior, and dreamed up some doable first-steps. All of this is documented in her down-to-earth, kid- and adult-friendly artistic style which manages to be engaging and cool where others can be redundant or simply too sober to capture a general audience. Inspiring others to go green can be an uphill battle, judging from the blank looks of non-comprehension that one may receive at times. However, Toronto-based artist Franke James shows that this doesn’t have to be the case. With her delightfully quirky style, James has been chronicling her personal journey in going green through a series of illustrated online essays for some time now, and her latest book,Bothered By My Green Conscience, finally brings five essays together in one edition. From her decision to “do the hardest thing first” by selling her SUV to de-paving her driveway to plant her own slice of Eden, James’ words and images allows us to enter her thought-stream. “Do the hardest thing first, before you change your mind,” she writes. But later on, she feels nostalgic and almost changes her mind, but reminds herself to “do the hardest thing first!” and pulls through, but not without a little pink (sigh) on the bottom of the page. We’ve admired her online visual/verbal narratives in these pages, and Franke James’ smart, fun, and only-seemingly-casually designed little book, Bothered by My Green Conscience is now making its way in the world. Illustrated and designed in an easygoing way that blends photocollage and a range of illustration styles from scribbly to nearly classical, the book shows practical how-to’s of a green lifestyle for busy people. The transition from illustration style to style keep the book surprising and active, page turn after page turn, but the contrasts are much more than just random. James selects her styles to subtly support and sometimes soften the rigor of what she’s asking of her readers in their lives. It’s a great example of form following function in a discursive presentation, just as intonation and volume do for spoken communication . . . gently prodding, supporting, cajoling, humoring and making humor — because this is a piece that is often funny. James has done a sensitive job of what could be a guilt-provoking subject. Credit also goes to her publishers for supporting her style and offering a serious — and seriously funny — alternative to running grey text. What’s bothering your green conscience? That’s a question North York resident Franke James likes to pose when discussing ways to help save the environment. James, who made headlines in 2007 when she became the first resident in the city to win approval to build a green driveway, recently released her first environmental book, Bothered By My Green Conscience: How an SUV-driving, imported-strawberry-eating urban dweller can go green. 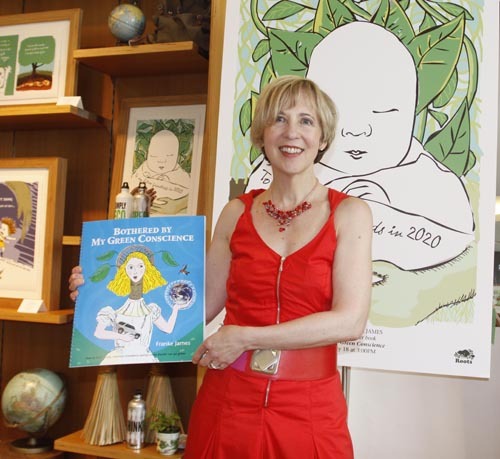 The book, printed entirely on reused paper, chronicles her decision to go green and the impact on future generations through drawings, photos and hand-drawn text. Franke James is an artist, photographer and writer focused on social change. An entertaining and persuasive advocate for the environment, she has a Masters degree in Fine Arts from the University of Victoria and lives in Toronto. Bothered by My Green Conscience is available through booksellers and online retailers, including Amazon, as of April 21, 2009. Has Franke’s Green Conscience grown that BIG?? Franke holds a large copy of Bothered by My Green Conscience for her presentation. A hearty congratulations for a well deserved acknowledgment of your work! Can’t wait to see it in print!! How time flies!! I have wondered how the book process was developing for you. Wow – Franke, I am so proud of you and this expressive endeavor. Way to go. The five stories chosen are some of my very favorites of your work. Needed a pick me up today in the midst of this deep winter so I thought I’d check and see if you had any more inspirational posts. I am delighted about your book and will be lining up to get several copies as soon as it is available. Your book will be a wonderful gift for family and friends who will treasure the artwork as much as the prose. Congratulations! !